A Six stroke engine describes a number of different approaches in the internal combustion engine to capture the waste heat from the four stroke Otto cycle and use it to power an additional power and exhaust stroke of the piston. Designs either use steam or air as the working fluid for the additional power stroke. As well as extracting power, the additional stroke cools the engine and removes the need for a cooling system making the engine lighter and giving 40% increased efficiency over the Otto Cycle. The pistons in a six stroke engine go up and down six times for each injection of fuel.The 6 stroke engine has 2 power strokes, one fuel, one steam or air. 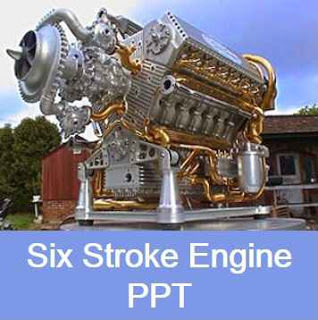 The currently notable 6 stroke engine designs include Crower’s 6 stroke engine, the Bajulaz engine and the 6-stroke engine. The Beare Head engine is called a six stroke by its designer but stands apart from the others. It uses a second opposed piston in each cylinder which moves at half the cyclical rate of the main piston, thus giving six piston movements per cycle. It does not use any additional working fluid. “Six-stroke engine (Trivandrum)”In the six-stroke engine developed by the students of College of Engineering, Trivandrum, India, the first four strokes are the same as a four stroke internal combustion engine. After the exhaust stroke, instead of air/fuel mixture (as in case of petrol engines), fresh air is sucked into the cylinder from the air filter, and is removed during the sixth stroke. The valve overlaps have been removed and the additional two strokes have been provided for better scavenging, using air injection. The engine shows 40% reduction in fuel consumption and dramatic reduction in pollution. Its specific power is not less than that of a four-stroke petrol engine. The engine can run on a variety of fuels, ranging from petrol and diesel to LPG. An altered engine shows a 65% reduction in CO pollution when compared with the four stroke engine from which it was developed. Billions of explosion engines are running worldwide at this time, and this era is not about to end. It is commercially obvious that the big market if for automobile, heavy goods, construction-site and farm vehicles. This is a priority for the six-stroke engine.Drastically reducing fuel consumption and pollution without radically affecting performances would allow the current concept of the automobile to be reassessed. There is, at this day, no wonder solution for the replacement of the internal combustion engine. Only improvements of the current technology can help it progress within reasonable time and financial limits. The six-stroke engine fits perfectly into this view. It’s adoption by the automobile industry would have a tremendous impact on the environment and world economy, assuming up to 40% reduction in fuel consumption and 60% to 90% in polluting emissions, depending on the type of fuel being used. Fuel consumption for mid-sized cars should be within 4 and 5 liters per 100km. and 3 to 4 liters for the small-sized cars. Automobiles equipped with the six-stroke engine could appear in the market within 3 to 5 years. 1) Motorboats might offer a big outlet for this type of engine. Their characteristics are perfectly suited to its use. Furthermore, the use of fuels other than gasoline would greatly reduce the risks of explosion. 2) Using non-fossil fuels of vegetable origin, natural gases and others, in simple, robust engine, operating with a minimum of adjustments and non-pollutant. 3) Many more applications may also be envisaged.